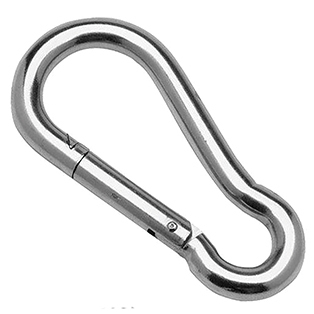 Our 316 Stainless Steel Carbine Snap Hooks are made with high corrosion resistance stainless steel. These Stainless Steel Carbine Snap Hooks have a 5 to 1 WLL which rates our Carbine Snap Hook's WLL at 20% of its Ultimate Breaking Strength. The WLL is the maximum load that should ever be applied and is based on an in-line pull with no shockload. A competent person should make an assessment of the conditions of use to determine the maximum load allowed.